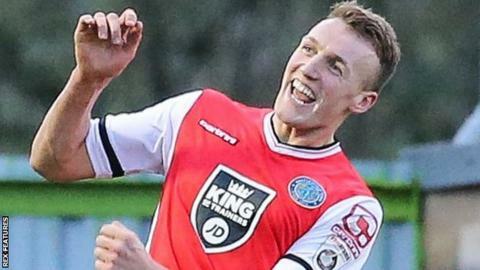 Macclesfield striker Jack Sampson went in goal for 86 minutes and kept a clean sheet to halt Dover's winning streak. The hosts had keeper Richie Branagan sent off for a foul on Ricky Modeste and, with no keeper on the bench, were forced to give Sampson the gloves. He made several saves but was less busy after Dover's Richard Orlu was red-carded after a clash with Reece Styche. The Silkmen dominated the second half but could not find a way through and had to settle for a draw. Dover stay third, and need one win from their remaining three games to seal their play-off place, while Macclesfield cannot now finish in the National League's top five. Match ends, Macclesfield Town 0, Dover Athletic 0. Second Half ends, Macclesfield Town 0, Dover Athletic 0. Attempt missed. Kristian Dennis (Macclesfield Town) header from the centre of the box misses to the right. Substitution, Dover Athletic. Liam Bellamy replaces Sean Raggett. George Pilkington (Macclesfield Town) is shown the yellow card for a bad foul. Second Half begins Macclesfield Town 0, Dover Athletic 0. First Half ends, Macclesfield Town 0, Dover Athletic 0. Reece Styche (Macclesfield Town) is shown the yellow card for a bad foul. Richard Orlu (Dover Athletic) is shown the red card. Attempt saved. Stefan Payne (Dover Athletic) header from the centre of the box is saved. Attempt saved. Stefan Payne (Dover Athletic) header from the centre of the box is saved. Assisted by Sean Raggett with a cross. Attempt saved. Danny M. Rowe (Macclesfield Town) right footed shot from the right side of the box is saved.